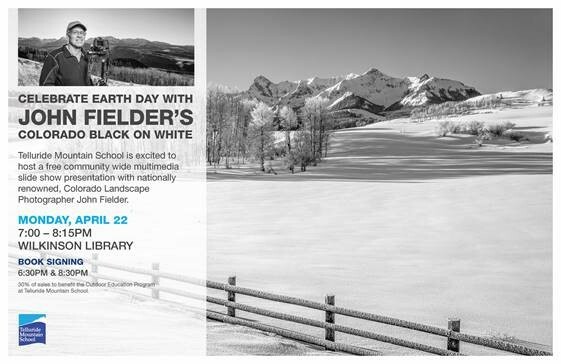 Telluride Mountain School is excited to host a free community-wide, multimedia slide show presentation and book signing with nationally renowned, Colorado Landscape Photographer John Fielder on Monday, April 22! John is an avid outdoor enthusiast, conservationist and a wonderfully talented landscape photographer. For the past 38 years, he has dedicated his time and passion to capture the serene and breathtaking moments of Colorado’s most majestic landscapes. The evening presentation will be a slide show featuring over 200 of his Colorado photographs. See Colorado from the Great Plains to the Rocky Mountains fade from color to black and white. Witness the edges, shapes, and textures of landscapes and wildlife without the distraction of color. Stories of life on the trail, beautiful music, and photo tips! John will feature images made in the past 40 years in and around Telluride and the San Juan Mountains and river canyons. John will be on hand before and after the show to sell and sign all of his popular Colorado coffee table books, guide books, and children’s books, including his new book Colorado Black on White. 30% of sales to benefit the Outdoor Education Program at Telluride Mountain School. John Fielder has worked tirelessly to promote the protection of Colorado’s ranches, open space, and wildlands during his 38-year career as a nature photographer and publisher. His photography has influenced people and legislation and has earned him recognition including the 1993 Sierra Club Ansel Adams Award, in 2011 the Aldo Leopold Foundation’s first Achievement Award ever given to an individual, and in 2017 Colorado Mountain College presented him an Honorary Degree in Sustainability Studies. 50 books have been published depicting his Colorado photography. He teaches photography workshops to adults and children, and his latest books are and Colorado Black on White and A Colorado Winter. He lives in Summit County, Colorado. Information about John and his work can be found at johnfielder.com.